What brings a smile to your face? Perhaps a holiday of discovery and relaxation could do the trick? On a P&O Cruises holiday you’ll find days so special, you just can’t help but share them. Also, book by 1 October 2018, and you’ll receive extra on-board spending money on all Select Price Sea view (Outside) cabins, Balconies and Suites - perfect for sharing even more special moments. 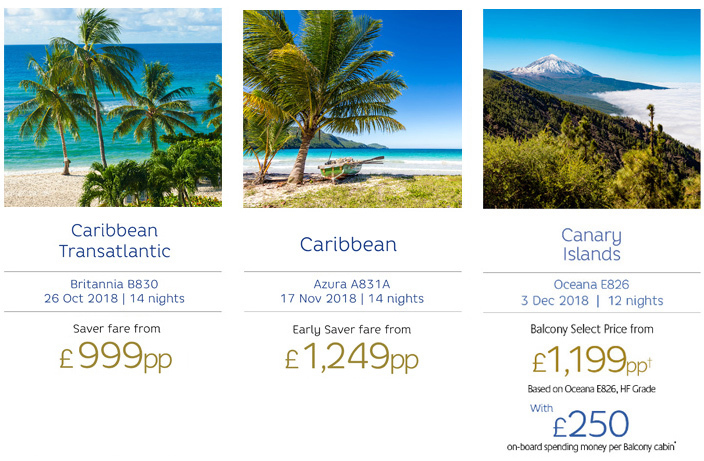 • 1 in 2 Ex-UK cruises are booked with P&O Cruises. • Two-thirds of P&O guests return. • P&O can trace their roots back 180 years. • The comforts of home – Sterling as the set currency, afternoon teas and 3 pin UK plugs. • Best of the British food scene with Food Heroes. • Entertainment for British tastes, including Strictly Come Dancing themed cruises. • The largest range of Ex-UK cruises. • A ship for every taste. • The freedom to holiday your way. 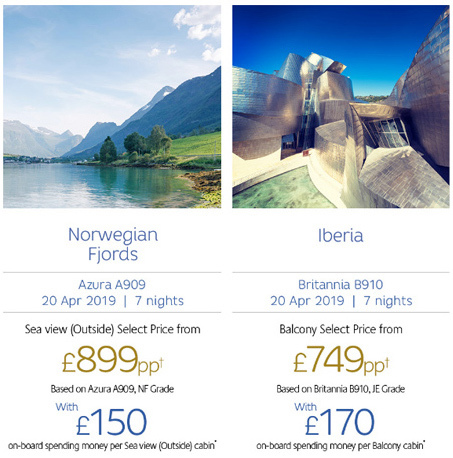 What's included on a P&O Cruises holiday? 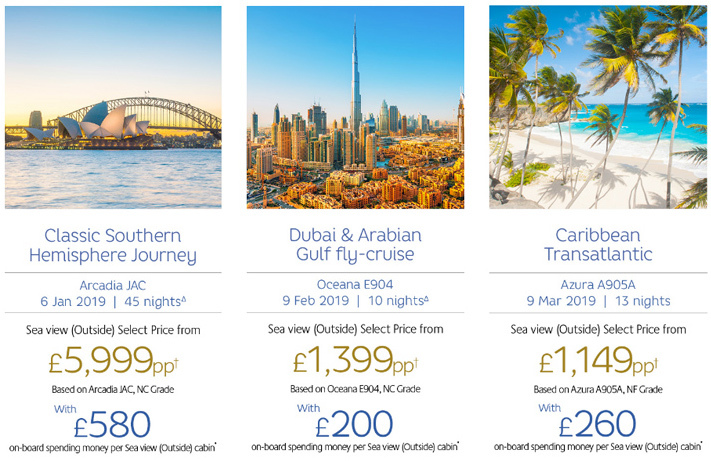 Select Price cruising is the cream of the crop, giving you a range of premium benefits including added extras on cruises of 7 nights and more**, plus priority choice of cabin, dining style and time, and any available upgrades. Bookings of applicable Select Price holidays made between 1 August – 1 October 2018 include extra on-board spending money in addition to the on-board spending money offered as a Select Price benefit. It can be used for on-board purchases of drinks, speciality dining, spa treatments, hair & beauty, fitness classes, shore excursions, purchases in the shops and photography. T&Cs for this section: ΔThe date of embarkation and number of cruise nights are displayed. Durations exclude the overnight flight, which is included in the price. *Extra on-board spending money on applicable Select Price Sea view (Outside) cabins, Balconies and Suites booked between 1 August – 1 October 2018. †Select Prices shown are per person based on two adults sharing the lowest grade of cabin available within the applicable cabin type and are subject to availability. Fly-cruise prices shown are inclusive of economy class flights from/to London and transfers. Prices may vary for other departure airports.